Looking across the river is where Clark Quay is. Those usual looking bathroom showers hanging along the river bank. What are they? 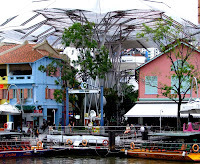 They have replaced the tents along Boat Quay to act as roof for the diners. Another stretch of dinning on the river banks. The transparent roof of Clark Quay looks more like gigantic umbrellas over the roads below. Clark Quay are rows of shophouses that have been placed under the conservation of old building Acts. And the roads in between also equally protected by the Act. No cars allowed on them. The lower photo is where the main taxi terminal is.